Monday, September 11, 7:00 to 9:00 PM join members of the Hudson-Mohawk Bird Club for their monthly speaker series. Details for this month’s program, presented by Gregg Recer and Cathy Graichen, are at https://hmbc.net/content/birding-eastern-gondwana-part-1-new-zealand. Take Long Island Expressway (LIE, I-495) to exit 62 (Nicolls Road/County Route 97). Go North on Nicolls Road for about 9 miles. After crossing Route 347 take a left at the 2nd traffic light (South Entrance of Stony Brook University's Campus) onto South Drive. At the next light, turn right onto Marburger Drive. Less than 1000' turn right into Marine & Atmospheric Sciences entrance and immediately bear right. Follow the road to the School of Marine & Atmospheric Sciences and Endeavour Hall. You may park in the lot in front of the building. The frequency of heavy downpours in the Northeast U.S. increased by 71 percent between 1958 and 2012. The costs associated with flood damage are rising across the nation and in New York State. Local governments have a key role in protecting their communities against flooding. In this webinar, participants will learn about how one New York town lowered its flood insurance premium rates by participating in the federal Community Rating System. Speakers will also discuss community flood resiliency in general and a project in Monroe County that is seeking to reduce flood-related problems, in partnership with the Genesee/Finger Lakes Regional Planning Council and The Nature Conservancy. Please provide us with your name and community affiliation, either via email or telephone to the Office of Climate Change at climatechange@dec.ny.gov or 518-402-8448. In the event that we cancel or postpone this webinar, respondents will be notified. For assistance with WebEx, call 1-800-697-1323 or 518-408-6487. This webinar can be accessed using an Android mobile phone, an iPhone, an iPad, or other computer running a Windows or Mac operating system. Note that you may have to download the WebEx plug-in and/or restart your browser to connect to the webinar, especially if you are using a Mac computer. Please join the webinar at least five minutes early to allow yourself some time to get connected. NYSDEC will host a public availability session to provide information on a recently finalized habitat management plan for Connecticut Hill Wildlife Management Area (WMA) located in the Towns of Hector, Catharine, and Cayuta, Schuyler County; Towns of Enfield and Newfield, Tompkins County. Come join us to learn about the goals of the plan and future management at this WMA. The meeting will include a presentation and time for questions. An open house will begin at 6:00 and a formal presentation at 6:30. The plan can be viewed on the Connecticut Hill WMA webpage. For more information, contact Adam Perry at 607-753-3095 x240. Cottage Place Gardens Phase 5 Parcel Site, site ID #C360161. This site is located at 8 Cottage Place and 178 Warburton Avenue. Comments about the applications and draft investigation work plans must be submitted no later than September 15, 2017. Click the web link above at "Additional Information" to learn about the sites and how to comment. The applications, draft work plans and other relevant documents can be reviewed at: Yonkers Public Library - Riverfront Library, One Larkin Center, Yonkers, NY 10701. 50 Circle Road, Stony Brook, NY 11790-3409, Phone: (631) 444-0278, E-mail: Daniel.lewis@dec.ny.gov. 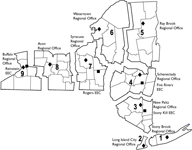 The New York State Department of Environmental Conservation (NYS DEC) proposes to amend Suffolk County Freshwater Wetland Map 13 of 39 to amend the boundary of an existing wetland. Comments on the accuracy of the proposed changes may be mailed to the person listed above through September 15, 2017. DEC invites the public to comment about proposed cleanup measures to address contamination related to the 509 West 34th Street Site (Manhattan), within New York's Brownfield Cleanup Program. Public comments about the proposal will be accepted through September 15, 2017. Project documents can be reviewed at: New York Public Library, Science, Industry and Business Library, Attn: John Balow, 188 Madison Ave. at 34th Street, New York, NY 10016; phone: 917-275-6975 --and-- Manhattan Community Board 4, 330 West 42nd Street, Suite 2618, New York, NY 10036; phone: 212-736-4536. DEC invites the public to comment about proposed cleanup measures to address contamination related to the Silos at Elk Street Site (Buffalo, Erie Co.), within New York's Brownfield Cleanup Program. Public comments about the proposal will be accepted through September 15, 2017. Project documents can be reviewed at: Buffalo & Erie County Library, 1 Lafayette Square, Buffalo, NY 14203; phone: 716-851-8900. Kick off the fall season by spending a day in the woods. Enjoy crafts for kids, live animals, hands-on activities, food, live music by Mama Earth and more! Call 716-683-5959 or see http://www.dec.ny.gov/education/68006.html/ for more information. No registration required. Fire Island National Seashore is co-sponsoring this saltwater fishing clinic with DEC. Fishing will follow instruction and education protion on saltwater fish identification, fishing regulations and surfcasting techniques. Ages 12 years and above are welcome. Cost: A parking fee is charged by the county. Check with Suffolk County Parks for details. Directions: Take Southern State Parkway to exit 68, William Floyd Parkway south to the end. (Or Sunrise Highway (Rt. 27) to exit 58, William Floyd Parkway south to end.) FINS Wilderness Visitor Center is located on your right. Parking is to the left at Smith Point County Park. Join us on Saturday, September 16th from 12:00 - 4:00 PM for a family-oriented environmental celebration featuring hands-on educational activities, interactive exhibits, interpretive walks and more. Enjoy opportunities to meet live hawks, owls, snakes and turtles up close and personal. Meet Smokey Bear, cast for “backyard bass,” and enjoy staffed exhibits from a wide range of local conservation partners...all absolutely free of charge! There will also be live music from local band Cautiously Optimistic, and sales of refreshments, plants and birdseed. DEC invites the public to comment about proposed cleanup measures to address contamination related to the 432 Rodney Street Site (Brooklyn), within New York's Brownfield Cleanup Program. Public comments about the proposal will be accepted through September 17, 2017. Project documents can be reviewed at: Brooklyn Public Library - Williamsburg Branch, 240 Division Ave., Brooklyn, NY 11211; phone: 718-302-3485 --and-- Brooklyn Community Board 1, 435 Graham Ave., Brooklyn, NY 11211; phone: 718-389-0009. DEC invites the public to comment about proposed cleanup measures to address contamination related to the Former Labelon Corp. Facility Site (Canandaigua, Ontario Co.), within New York's Brownfield Cleanup Program. Public comments about the proposal will be accepted through September 18, 2017. Project documents can be reviewed at: Wood Library, Attn: Jenny Goodemote, 134 North Main St., Canandaigua, NY 14424; phone: 585-394-1381. This September 19, 2017 hearing has been postponed due to weather. The new date for this hearing is scheduled for October 26, 2017 at the Suffolk County Water Authority located at 260 Motor Parkway, Hauppauge, NY 11788. The hearing is scheduled to begin at 6 PM on October 26. DEC has received a Brownfield Cleanup Program (BCP) application and Draft Remedial Action Work Plan (RAWP) for a site known as Former Imperial Cleaners Site, site ID #C130532. This site is located in the Village of Lake Success, Nassau County, at 218 Lakeville Road. Public comments regarding the application and draft RAWP must be submitted no later than September 23, 2017. Project documents can be reviewed at: Station Library, 26 Great Neck Road, Great Neck, NY 11021. DEC has received a Brownfield Cleanup Program (BCP) application and Draft Remedial Action Work Plan (RAWP) for a site known as 70 Nardozzi Place, site ID #C360159. This site is located in New Rochelle, Westchester Co., at 70 Nardozzi Place. Public comments regarding the application and RAWP must be submitted no later than September 8, 2017. The application, draft RAWP and other documents can be reviewed at: New Rochelle Public Library, 1 Library Plaza, New Rochelle, NY 10801. National Hunting and Fishing Day is celebrated the fourth Saturday of every September to promote outdoor activities like hunting, fishing, and target shooting. There are many activities across the state you can participate in. Head out and enjoy one near you! National Hunting and Fishing Day is a designated free fishing day in New York which means anyone can fish the freshwaters of New York and no fishing license is required. In the fall berries and other fruit hang on the bushes and trees that line the trails at Five Rivers. Would you like to know more about these colorful additions to the landscape? Join us on Saturday, September 23rd @ 10:00 am for this outdoor guided walk to discover more about nature’s edible decorations and the animals that eat them. This informative stroll will be about a mile long and on relatively flat terrain. Bring binoculars if you have them. You will learn how to use a handheld Global Positioning System (GPS) unit, then search for hidden clues to solve nature mysteries. For adults and children ages 8 and older. Registration required; call 716-683-5959 to sign up. Have you ever wanted to know more about the live and mounted animals in the visitor center at Five Rivers? Do you wonder what Argo the owl’s favorite food is, or which birds visit the feeders and what makes them special? Join us on Saturday, September 23, 1:00 to 3:00PM to ask questions about the critters in Five Rivers’ front room, and hear behind-the-scenes stories about the live animals on display. Drop in during the afternoon; staff will be on hand to answer your questions. There’s something for everyone at “Science on the River"
Celebrate National Estuaries Week and the 35th anniversary of the Hudson River National Estuarine Research Reserve with a “Science on the River” open house at the Norrie Point Environmental Center at the Mills Norrie State Park in Staatsburg. There will be demonstrations and hands-on activities for young and old alike, as well as a free family fishing day. Scientists from the Research Reserve and other regional research organizations will be on hand to answer questions about their work and demonstrate techniques for studying the Hudson. This program is free and most exhibit areas are wheelchair accessible. The Norrie Point Environmental Center is located in the Margaret Lewis Norrie State Park in Staatsburg, Dutchess County. Directions can be found on the DEC website. For more information, please call 845-889-4745. “Science on the River” free open house at the Norrie Point Environmental Center, Staatsburg NY, on Saturday Sept. 23rd from 2-5 PM. Contact James Herrington at james.herrington@dec.ny.gov if you have questions.